On Saturday Parkrun Frimley Lodge saw the biggest number of members in action with fifteen running. Clive Rolfe was first to finish for the club in 19:21 followed soon after by Max Woods whose 20:17 is his fastest time in 2017. Philip Boylan improved his best time by 20 seconds lowering his PB to 23:08. Pam Whelan was only 2 seconds shy of equaling her best. It was the third birthday for the team at Rushmoor and 493 runners celebrated including ten SJs. I (Craig Bowles) was first to finish for the club with Lisa Hale slotting in a short race inbetween marathons to finish next in 21:17. Limited Parkrun tourism this week. John Tovell vacationed at home at Crane Park while Royston Crandley and Paula Vine visited Homewood. Graham Meek travelled to the Isle Of Wight for the IOW First Half Island Challenge as part of his preperation for his big ultra challenge; The London to Brighton 100k Challenge at the end of May. He looks to be well on track for the big one with a superb performance on the hilly 52km IOW course finishing in 5:20:35 to bag 3rd position overall. Plenty more marathons on the calendar and Leon Hicks continued ‘The Quest’ with 4:56:11 at the Milton Keynes Marathon while Kate Parker recovered well from London to accompany Leon for part of the course to record 2:12:19 in the concurrent Half Marathon. Lisa Hale tackled the 3 Forts Marathon finishing the 27 miles in a course PR of 4:12:29. Also on Sunday the Run Frimley 10k attracted a large contingent of SJs. Phil Guy was first finisher for the club as he set a new PB in 40:15. He was followed over the line by Neil Praine who continued his excellent form setting another PB in 40:18. Both finished in the top 30. Other finishers were Jim Laidlaw (43:00), John King (44:04), Erol Ali (46:06), Jane Crawford (50:12), Stuart Holbrook (51:06), Fern Stonestreet (51:47), Callum Lundie (53:12), Elin Loftesnes (54:53), Jon Curham (59:27), Angela Foker (1:01:18), Roger Halliwell (1:02:13), Catherine Dunn (1:02:13), Jenny Morris (1:05:08), Danielle Scott (1:06:23), Suren Mannick (1:07:45), Jan Lovelock (1:08:40), Louise Heginbotham (1:09:48), Susan Hopkinson (1:10:01), Fiona Gascoigne (1:15:26). 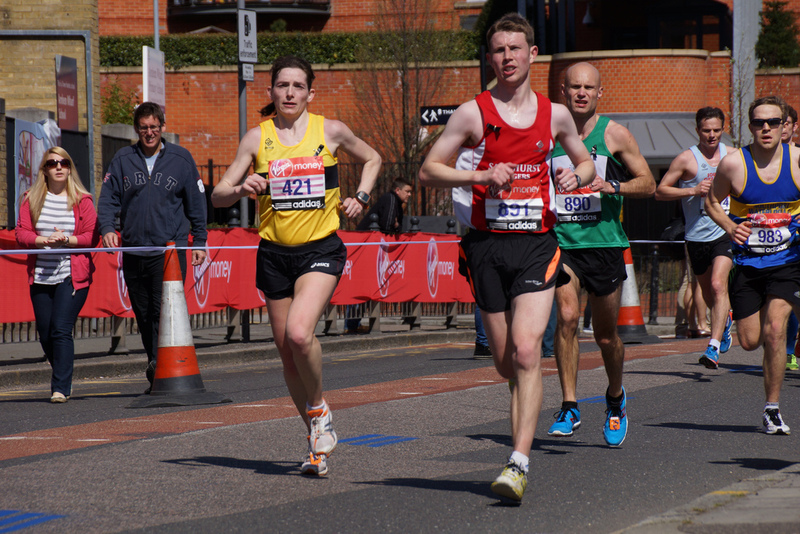 Up in the midlands, Pam Whelan ran well at the Great Birmingham 10k finishing the city based course in 1:00:44. On the Strava leaderboard, the Marathon Queen of April Lisa Hale regained her crown with the Three Forts (27 mile) Marathon contributing to her 87.3km total. Graham Meek dropped to 3rd sacrificing some volume for a great performance on the Isle of White in his 50k race. Impressive he still logged 62.3km in only two runs! Back from injury Krzysztof Zielinski took second with 64.2km. Sixty-three members logged runs this week. To take part in this just create a free Strava account and link it to the club in your profile. Tuesday: This week the Tuesday runs start at the Morgan Recreational Park in Crowthorne at 6:30pm as it is the first Tuesday of the month. In addition the interval session meeting at The Tythings in Yateley at 8pm will be a Pyramid session at Blackbush airfield – 1 x 5 minutes, 2 x 4 minutes, 2 x 3 minutes, 2 x 2 minutes, 2 x 1 minutes. Wednesday: Sharon Burfield and/or Andrea Vincent will be leading a great run from Sandhurst Memorial Park departing at 7pm. Thursday: This week the threshold/improvers run will be off road and Nikki Stanley will confirm the route and details in her inimitable style nearer the time. Friday: Track is still free and the THREE coaches have some great sessions planned for all abilities to improve fitness and technique. A number of members have seen improvements as a result of tweaks in their running form identified at the track sessions. Another great post there Craig and was wondering, ‘did I miss you at Rushmoor, blank you or miss each other like passing ships in the night? If I did blank you, sorry. If you see me again, please say hi as I think I have only seen you once and was a while ago. Thanks for the mention Craig, but I’m afraid I’m a long way off my PB, let alone knocking 2 minutes off, unless Park Run are also resetting pre-2005 records?